One thing I’ve noticed is that many homeowners tend to ignore the cleanliness of the outside of their home. Dirt, grime, mold and mildew can severely damage your home’s exterior and cause wood rot and premature fading. Regular pressure washing is the remedy. 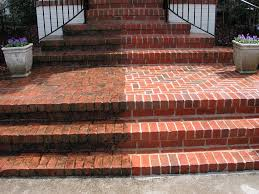 Pressure washing is the best method to ensure that the existing coating of paint will last longer. It is also the best way to prepare for refinishing or painting. Professional pressure washers not only make the outside of your home look new again but can also clean your roof, driveway and sidewalks. Your windows also collect dirt and grime and that affects the amount of light coming into your home. If you have never had your home pressure washed you’ll be amazed at the added light it brings in after your windows are cleaned. You wouldn’t go years without cleaning the inside of your home so don’t forget about the outside. It will not only improve your curb appeal but it is also preventative maintenance for the exterior of your home. I recommend a yearly cleaning if your home is surrounded by trees or at least every couple of years. Get a few estimates from different companies and check their references so you know what to expect. Pressure washing is an easy fix for fabulous curb appeal.